The best length of content? The length your buyer wants now. Hook people’s attention quickly, in the first 7 seconds. What is the best length of content? Start with this fact: people’s initial attention span is only a few seconds — not much time for your message to make the right impression. If you successfully hook buyers’ interest in the first few seconds, they will eagerly consume content for 2 minutes, 5 minutes, 20 minutes or more. The best length of the content is the one that meets your buyer’s immediate need. Make content to fit people’s attention spans. To deliver the best length of content for buyers, create content “snacks” first. Snacks are pieces of content that are 7 seconds or 23 words long – the length of the average sound bite in news media. In the first 7 seconds, your message “snack” either will attract someone’s interest – or it won’t. Your 7-second message serves as a headline, an email subject line, a Tweet, or an elevator pitch. If buyers consume your 7-second content and want to know more, it’s time to scale up to longer content. 20 minutes or 4000 words. The best length of content needs to address the buyer’s immediate needs. Serve up tasty snacks to lure buyers into a full-course content meal. Here’s a model of content lengths to fit any medium or occasion. 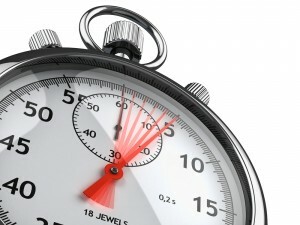 Build your marketing message to scale up gracefully from 7 seconds up to 20 minutes or more. Start with short “snack” content that captures customers’ attention, then earn the right to share longer-form content. 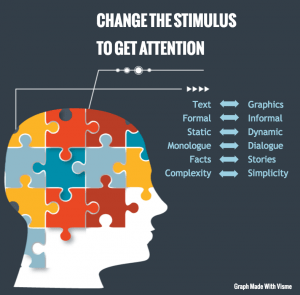 Change the stimulus to gain attention. After 20 minutes, neuroscientists have found that people struggle to pay attention unless you vary the stimulus. Here are ideas for how you can vary the stimulus to keep people engaged for more than 20 minutes. Change the stimulus to hold audiences’ attention, says neuroscientist Dr. Carmen Simon. To make it easier to scale up your company’s content, create a Message Map. A Message Map provides you content ideas scaled to address 7-second, 2-minute, 5-minute or 20-minute needs. 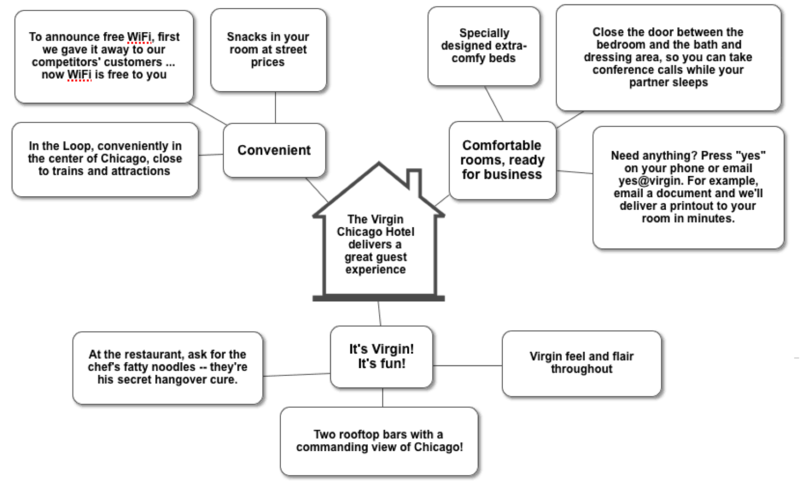 Creating a Message Map ensures that you always offer consistent, concise and clear content for any medium or occasion. Divide a 20-minute read, such as a white paper, into 10 2-minute blogs. Transform a series of Tweets into a blog or article. Divide an article into a series of Tweets. There’s a myth that people don’t read long-form content. Not true. People use long-form content, especially when they are making big decisions about carefully considered purchases. When there’s enough at stake in the buying decision – for example, when people buy a house, start a business, pay college tuition or fund a retirement plan – they will devote the time to learn all they can from content. For business-to-business buyers, the stakes are sometimes inherently high – for example, when the company plans to spend millions of dollars to build a new capital facility or renew its infrastructure. Such buying decisions are entrusted to committees, which present their own unique challenges for content marketing. To address all your buyers’ needs, use a Message Map to create a marketing message that scales up from 7 seconds to 2 minutes, to 5 minutes, to 20 minutes. Make your message scale up gracefully to meet any need. 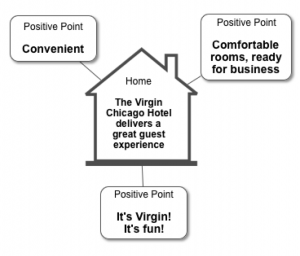 Here’s a simple Message Map for the Virgin Hotel Chicago, its whole story in 7 seconds. The same message scales up gracefully to 2 minutes. 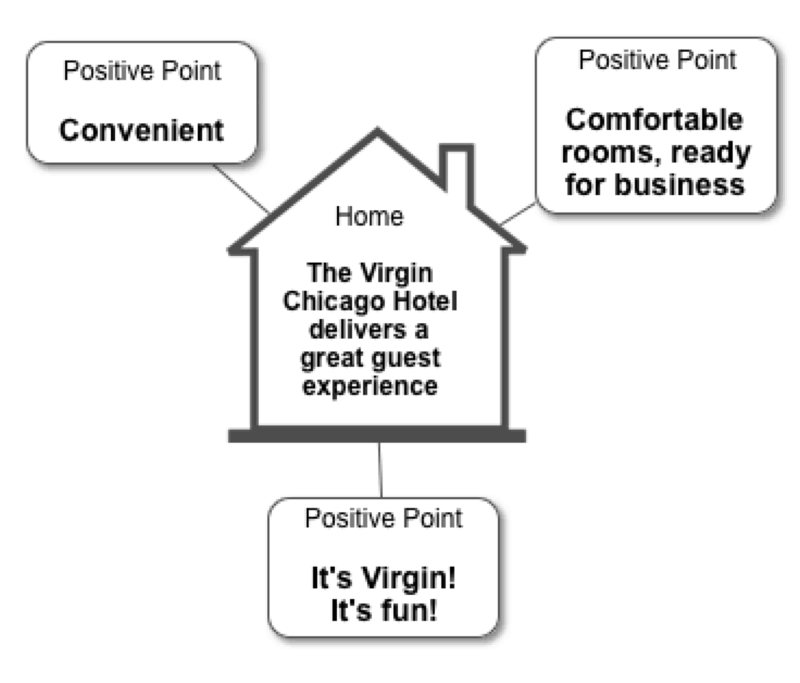 Virgin Hotel’s Message Map adds proof points to flesh out the message. To scale up this message even further, add details about the food, the bar, the rooms and nearby attractions. You get the idea. To learn which length of content your audience wants most, ask buyers through research and observe buyer behaviors through website and email analytics. Which of your webpages attract readers for a minute or more? What pages prompt them to look at more content? Build on small, short-term content successes to realize even bigger success over the long term. People start out with a question, pain point or problem to solve. They use search or social media to find the content they need. Most people use mobile devices to hunt for content. People scan more than they read, since their attention is often divided among multiple screens, an Adobe study found. An Adobe study found that most people always or frequently use multiple screens at the same time. Make sure your content is highly scannable, so buyers find what they’re looking for quickly. Use headlines, subheads, captions, call-outs and bullets to snag scanners’ attention. Make sure your content addresses real buyer needs so it’s relevant and resonant. Great content answers people’s real questions, educates them, and helps them make smart choices when it’s time to buy. 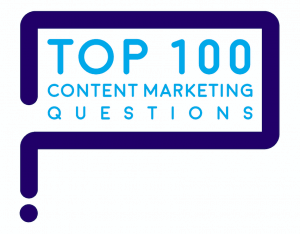 To understand exactly what your customers want to know, here’s a step-by-step process to identify your customers’ top 100 questions. 97% of people read the headline. 98% of people look at the subhead, but it’s more of a glance than read. 91% of people read the caption that accompanies a photo. 60% finish a short article, but the time spent on it shows they’re skimming, not reading every word. A banner ad gets less than 1.5 seconds of attention. That’s why your content must always include highly scannable elements – such as headlines, subheads, images with captions, call-outs and bullet points – to help scanners quickly find what they’re looking for. Keep words, sentences and paragraphs short to maximize readability, especially if most your content is delivered to a mobile phone. Avoid ad-like elements because people skip them. People completely avoid content that looks like an ad. 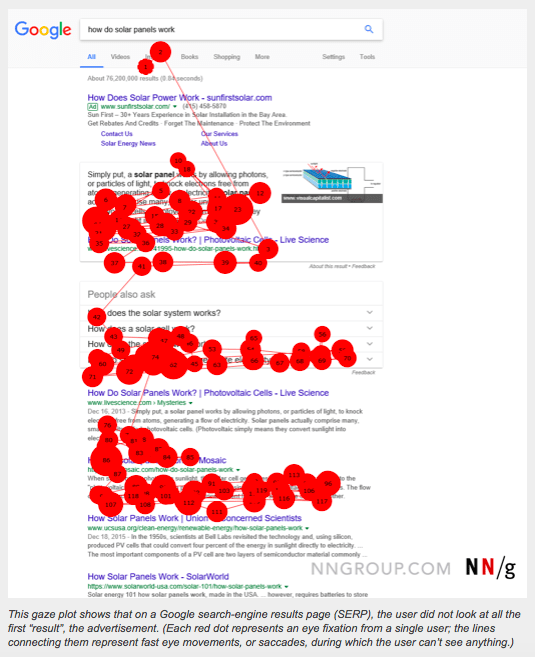 People skip over ad-like elements, the Nielsen Norman Group found. Text embedded in the image. Make content scale to fit people’s attention spans. Avoid creating ad-like elements that people skip over. 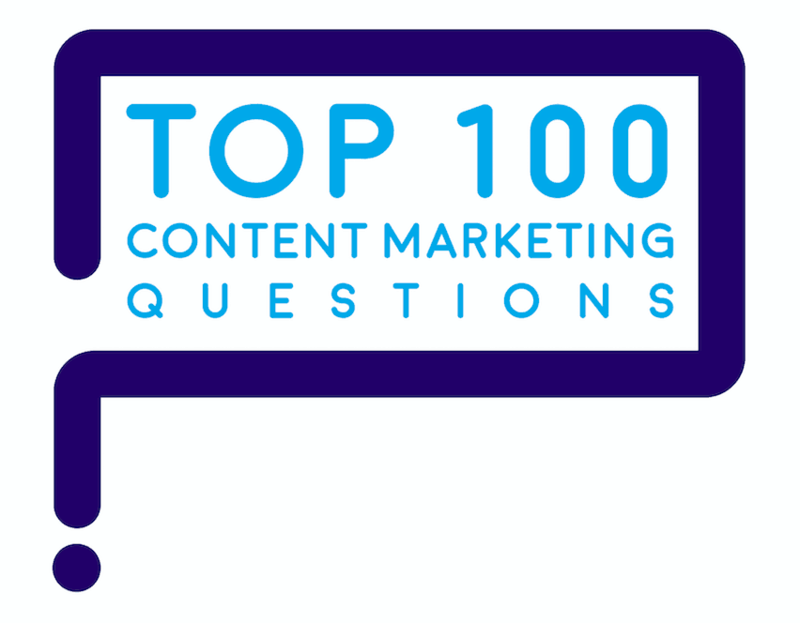 Here are answers to more of the Top 100 Questions on content marketing, posed by marketers like you.